Tanauan, officially the City of Tanauan, (Tagalog: Lungsod ng Tanauan), or simply known as Tanauan City, is a 2nd class city in the province of Batangas, Philippines. According to the 2015 census, it has a population of 173,366 people. It is incorporated as a city under Republic Act No. 9005, signed on February 2, 2001, and ratified on March 10, 2001. With the continuous expansion of Metro Manila, the city is now part of Manila's conurbation which reaches Lipa in its southernmost part. The city shares its borders with Calamba, Laguna, to the north, Tagaytay, Cavite, to the northwest, Talisay to the west, Santo Tomas to the east, and the towns of Balete and Malvar to the south. It borders on Taal Lake to the west. The town is known for the Old Tanauan Church Ruins, the most important archaeological site in the municipality where human remains from the colonial era have been unearthed. Among those born in Tanauan are revolutionary former Prime Minister Apolinario Mabini and former President José P. Laurel. Some people believe that Tanauan derived its name from the Tagalog term tanaw, meaning to look after through the window. This is based on a fortress which had a watchtower built by the Augustinian friars and natives. The watchtower allowed them to monitor incoming “champans” or boats entering through the Pansipit river, which were either traders or pirates. From this tower, one can have a clear view (tanaw) of the lake and of the vast plains and rolling hills. The Town of Tanauan was founded on its present location in 1754, having been transferred from the fringe of Taal Lake where it was originally situated. It is generally believed that Tanauan, together with Sala was founded in 1572 by the Augustinian missionaries who built a mission at the shore of the lake known as Bonbon (now Taal). The town, however, was totally destroyed during the most impressive and catastrophic historically recorded eruption of Taal Volcano in 1754. Together with the community of Sala, the residents of Tanauan were relocated to safer places. Tanauan moved to Bañadero, then to its present location. Sala, on the other hand, transferred from its original site to where it is located now. Sala subsequently became a barangay of Tanauan. Tanaueños have displayed characteristics of personal independence and nationalism since early history. The town is called the cradle of noble heroes due to its contribution to the revolutionary movement of its sons Apolinario Mabini, the brains of Katipunan, and later by the statesman Jose P. Laurel. Also, three Tanaueños served as governors of Batangas, namely: Jose P. Laurel V, Modesto Castillo and Nicolas Gonzales. Recent events include the assassination of its former mayor, Cesar V. Platon, by NPA rebels on 7 May 2001, as he was running for the governorship of Batangas. This happened a few days before the election. On 2 July 2018, then-incumbent mayor Antonio Halili, noted for public humiliation campaigns against criminals and drug pushers, was assassinated during the flag raising ceremony at the city hall. The Congress approved the then Batangas 3rd District Rep. Macario Laurel's bill and a Senate counterpart measure on Dec. 19, 2000 the Republic Act No. 9005 known as "The Charter of the City of Tanauan." On February 2, 2001 President Gloria Arroyo signed it into law. On March 10, 2001, a Saturday, the charter was approved by a referendum in Tanauan that drew 8,890 or 16% of the 55,453 registered voters. Two ballots were either spoiled or blank. The "yes" had it over the "no" by a landslide, 7,026 to 1,961. According to cityhood advocates, quoted in reports reaching Batangas on Sunday, the turnout, despite being two times better than previous conversion-to-city exercises, was still only 16%. They were not aware of what was going on. They were aware of the cityhood plan and were indifferent to it. They were aware, were in favor of the cityhood plan, but were too lazy to take part in the plebiscite. They were aware, were against cityhood, and voted by their feet. 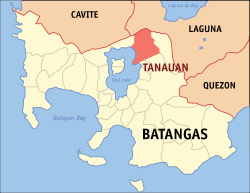 Tanauan is politically subdivided into 48 barangays. Roman Catholicism is the most dominant and visible religion in Tanauan. St. John the Evangelist is its patron, and its main church is the St. John the Evangelist Parish. La Consolacion College Tanauan (formerly Our Lady of Fatima Academy, 1948), run by the Augustinian Sisters of Our Lady of Consolation, is the first Catholic school in the city. Other Catholic schools include Our Lady of Assumption Montessori School and Daughters of Mary Immaculate School (lay-operated). First Asia Institute is converting from a non-sectarian school to a Catholic (Christian) school. Iglesia ni Cristo, Jehovah's Witnesses, Mormons (The Church of Jesus Christ of Latter-day Saints), Islam and other religious groups are also present in the city. Tanauan is known as an agricultural trading center of CALABARZON Region. Agri products from CALABARZON and as far as MIMAROPA and Bicol regions are being sent here before it reaches Metro Manila public markets. Aside from being an important agricultural center, Tanauan is also one of the Philippines' major industrial centers nowadays hosting four industrial parks which is home to various multinational companies and tourism facilities. A 450-hectare industrial park owned by Lopez Group and Sumitomo Corporation located in Tanauan and Santo Tomas, Batangas. FPIP Tanauan is the location of various multinational companies such as Nestlé, Honda, Brother Printers, Canon Philippines, Shimano, B/E Aerospace, Philip Morris-Fortune Tobacco Corporation and many more. Formerly PhilTown Technology Center located in Brgy. Pagaspas which is now owned by First Philippine Holdings of the Lopez Group of Companies. 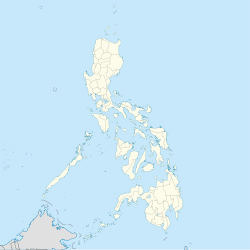 This is home to Uni-President Philippines, the manufacturer of Homi instant noodles and Nooda Crunch. An industrial park in the Tanauan-Malvar area. It is the location of Metro Manila Turf Club. An industrial park owned by Data Land Corporation. This hosts the precast manufacturing facility of the said company. A multi-sectoral development by the Torres Group of Companies located at the center of the new Tanauan Central Business District. It is now the location of the new Tanauan City Hall, which was inaugurated last July 23, 2017. In front of the new city hall is the new Tanauan People's Park. Aside from government centers, TCZ will also hosts office towers, condominiums and commercial centers by 2019. Tagaytay Highlands Tourism Economic Zone- by Belle Corporation. Jeepneys serve the city and the nearby municipalities and barangays. Tricycles provide transportation on the barangays. Buses connect the city with Manila and Batangas City. Aside from the STAR Tollway, national roads like the Jose P. Laurel Highway (Route 4) and Tanauan – Talisay Road (Route 421) serves also the city. The city also maintains roads that connects the rural barangays of the city. Among the tertiary educational establishments in Tanauan is the First Asia Institute of Technology and Humanities, La Consolacion College, Nova Schola, the STI Academic Center, the DMMC Institute of Health Sciences, and the Tanauan Institute. The Tanauan Institute is the oldest private education institution in the city having been established in 1924. The Sapphire International Aviation Academy which caters to aspiring aircraft pilots is also located within the city at the Barradas Airstrip. There are 9 private and 12 public high schools, and 27 private and 44 public elementary schools. ^ "Province: Batangas". PSGC Interactive. Quezon City, Philippines: Philippine Statistics Authority. Retrieved 12 November 2016. ^ "Historical Background, Tanauan City Website, Retrieved: Saturday, 15 October 2011". tanauancity.gov.ph. Retrieved 11 April 2018. ^ Arnell Ozaeta; Rene Alviar (January 14, 2002). "Cops zeroing in on 4 more Platon 'killers'". The Philippine Star. Retrieved August 23, 2012. ^ Maricar Cinco (July 2, 2018). "Tanauan mayor dead after flag ceremony shooting". Inquirer News. Retrieved July 2, 2018. ^ ABS-CBN News (July 2, 2018). "'Walk of shame' mayor shot dead". ABS-CBN News. Retrieved July 2, 2018. ^ a b "Batangan: Tanauan backs into cityhood; House panel okays "jueteng" bill; Laurel drops plan for Santo Tomas cityhood". www.geocities.ws. Retrieved 2 July 2018. ^ "Barangays of Tanuan City, Tanauan City Website, Retrieved: 15 October 2011". tanauancity.gov.ph. Retrieved 11 April 2018. ^ "Province of Batangas". Municipality Population Data. Local Water Utilities Administration Research Division. Retrieved 17 December 2016. ^ Admin. "Service road sa STAR Tollway, bubuksan". www.tanauancity.gov.ph. Retrieved 11 April 2018. Wikivoyage has a travel guide for Tanauan. Wikimedia Commons has media related to Tanauan, Batangas. Wikisource has the text of a 1920 Encyclopedia Americana article about Tanauan, Batangas. "Tanauan" . Encyclopædia Britannica (11th ed.). 1911. This page was last edited on 23 March 2019, at 17:19 (UTC).